'November Rain' Is The Oldest Song With A Billion YouTube Views – What's That Mean? 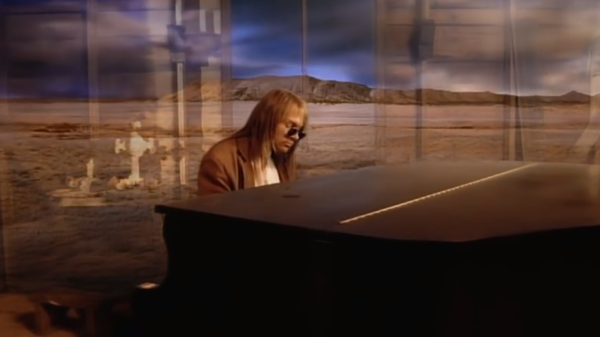 Guns N' Roses' "November Rain" has more than a billion views on YouTube. Earlier this week, Guns N' Roses' video for "November Rain" hit a curious milestone: Released in 1992, it's the oldest video ever to be streamed a billion times on YouTube. That accomplishment speaks to many phenomena at once: Guns N' Roses' considerable staying power, the ambition of a song and video that exceeds nine minutes in length and the case for considering "November Rain" the "Stairway to Heaven" of its time. The band remains an enormous draw in Central and South America, where it tours frequently and which did a lot of the heavy lifting in propelling it — and, notably, dozens of Latin artists — across the billion-views mark. (Music industry analyst Mark Mulligan broke this down a bit last year.) It turns out the most-viewed video of the 1980s, at just shy of 700 million, is Guns N' Roses' "Sweet Child O' Mine." But the "November Rain" milestone speaks to other phenomena, as well. For this story, a YouTube representative passed along a ranked list of every music video to surpass a billion views — Luis Fonsi and Daddy Yankee's "Despacito" is tops by a substantial margin, followed by the neck-and-neck pair of Wiz Khalifa's "See You Again" and Ed Sheeran's "Shape of You" — and "November Rain" is surpassed by a whopping 112 clips. YouTube itself launched in 2005, and many license-holders didn't embrace the platform until several years later (Universal Music Group and Google launched Vevo in 2009 as a way for the major label to maintain control its music video content) so the billion-views list mostly provides a tour of dominant singles from the past decade. What YouTube metrics for older songs don't always provide, then, is an airtight sense of how often videos have actually been viewed in the Internet era. Take the case of "Never Gonna Give You Up," the 1987 Rick Astley chart-topper that spawned the Internet phenomenon known as "rickrolling," the practice of hyperlinking to what promises to be sought-after content but which turns out to be the "Never Gonna Give You Up" video. That prank led many, many people to a rip of Astley's video on YouTube, but that wasn't the authorized video, which didn't hit the site until 2009 and now has 456 million views. The original prank video, titled "RickRoll'd," was posted in 2007 then removed because it was a terms-of-use violation, then later re-added, now has 77 million views. Other versions pepper the site, adding a few hundred thousand views here and there. Of course, if the practice of rickrolling had been born this morning instead of more than a decade ago, "Never Gonna Give You Up" might sail past "November Rain" by Christmas. Just think about how much YouTube's reach and user base has expanded since 2007: The first iPhone didn't launch until that year, vastly fewer people had broadband access worldwide and music license-holders first viewed YouTube primarily as a den of piracy to be policed (encapsulated, perhaps, in long-running, recently settled "Dancing Baby" case, which saw Universal Music Group suing a mom for uploading a video of her baby dancing while a Prince song played in the background). We thought memes traveled quickly in those days, but we had no idea. At least for now, the reign of "November Rain" feels pretty safe. The titles bubbling just under a billion — songs by Shakira, J Balvin, Mike Posner, One Direction, ZAYN and Coldplay, among others — are all far more recent, while other dominant '90s videos (Nirvana's "Smells Like Teen Spirit," The Cranberries' "Zombie," et al) at least so far sit in the 750 million range. Of course, lest we confuse any of these metrics with actual staying power, here's one more statistic for you: As of this writing, Guns N' Roses' classic video for "November Rain" is roughly 286 million views behind "Axel F" by Crazy Frog. So we've all got work to do.